Posted September 26th, 2015 by Melody Taylor-Fliege & filed under Diversity, Leadership, Life Coaching. Wow! Wow! Wow! Ich liebe coaching! Today was so empowering as a life coach to witness the transformations big and small as I connected with people from Israel, Australia, Deutschland, USA, Czech Republic, and around the World both in English and auf Deutsche. The coaching was free but the payment I received in return was priceless! Ein Großes Dankeshön an unsere Coaching-Team! Our Coaching-Team connection today was energized, empowered and we worked together in a way that brought great success to this first street coaching flashmob, not only in Berlin, but also the first of it’s kind in Germany! ICF-Deutschland can certainly be proud of this Flashmob Coaching-Team today! 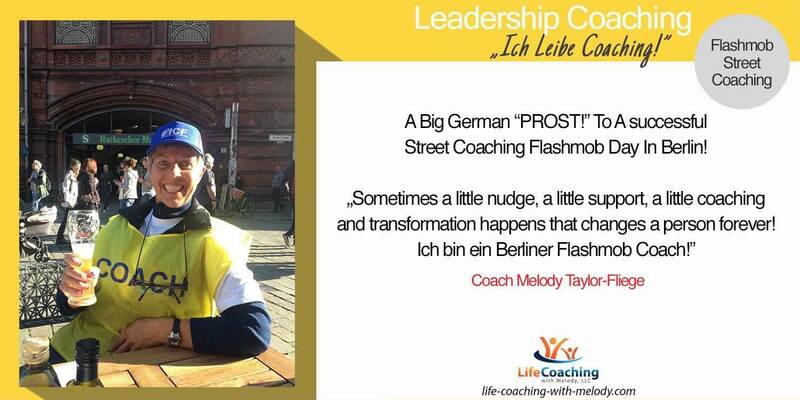 Follow us on Coaching Flashmob Berlin. A Big German “PROST!” To A successful Street Coaching Flashmob Day In Berlin!